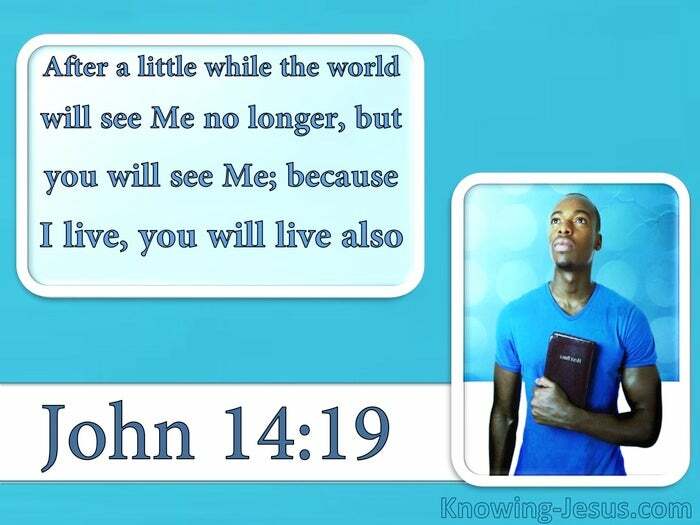 What Does John 14:19 Mean? The sudden shock of hearing that Jesus was leaving to go back to the Father must have been desperately disturbing for the disciples, but Jesus quickly started to explain.. that although they could not go with Him at that time, their physical separation from Him would only be temporary. Jesus was going to prepare a heavenly abode for each one of them, and unless He went away the many benefits that were planned for believers.. and the glorious mysteries surrounding the Church.. which would be later revealed through the apostle Paul - would not be able to be realised. 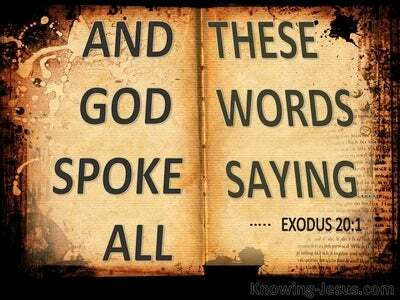 Up to this point God was using Israel to be His witnesses to a lost and dying world, but they had rejected their Messiah Who would soon be crucified on Calvary's cross. 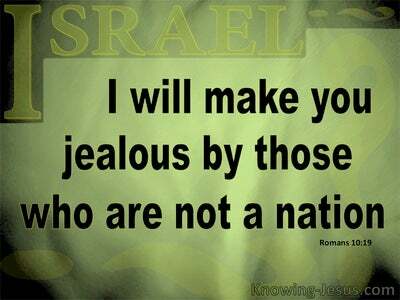 As a result Israel was set aside until Christ's second coming. But in the meantime the Church was to be the organism through which God would now continue to carry out His sovereign plans and purposes.. for the redemption of the world.. And in this chapter Jesus begins to explain to His disciples, some of the things which would happen between the time of the cross and the coming kingdom - between Calvary and the millennial rule of Christ.. between the death, burial and resurrection of the Lord Jesus Christ and His triumphant return as King of kings and Lord of lords. He told them that in a little while He would be gone.. and the world, which had rejected Him would no longer see Him. But although He was going away, to prepare a heavenly home for them - nevertheless He promised that would still be with them.. for both He and the Father would come to them and dwell within the body of all believers - in the near future! They would not see Him physically but they would see Him with their spiritual eye of understanding, and He promised to one day return to take all who love and trust in Him, to be with Himself into heaven. Although the disciples must have been bewildered by the suddenness of this disclosure, Jesus assured them that He would be with us in spirit and in truth and He also promised to send another Helper to guard and guide his children.. a Teacher to guide us into all truth.. a Counsellor to be with us in times of difficulty and danger.. a Comforter to comfort us in our sorrows - a Helper to help in times of trouble. 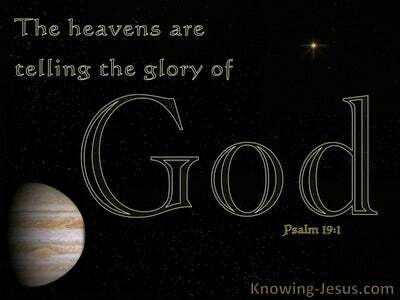 Jesus promised to send the Holy Spirt of truth Who was already with them - but would one day dwell in all who believe. Through they did not understand all that He told them until later, Jesus gave them further reassurance by telling them that because He lived they would live also. At the time they did not understand that within hours Jesus would be nailed to the cross, to die the death that we all deserve. He was to identify with our sin; be crucified in our our place and pay the price for our trespasses. He would receive the death penalty on our behalf, but the sacrifice of His sinless life would satisfy God's wrath against our gross sinfulness.. and the multiplied sins of the whole world. But death could not hold the eternal, deathless Son of God in its icy grip. The power of the grave was insufficient to keep the dead body of the sinless Son of Man.. entombed in the heart of the earth - for in Him was LIFE - the eternal, resurrected life that becomes our life, when we trust in Him for salvation. The plan of redemption dictated that death had no power over His sinless life for as the eternal Creator-God, He is a life-giving spirit. Having paid the full price for the sin of the world through death - death could no longer hold Him in its vice-like grip. Having been made sin for us on the cross, the eternal Son rose again from the dead as our ever-living Saviour. And so God raised Him from the grave, freeing Him from the agony of death, because it was impossible for death to maintain its hold on the Prince of Life. Just as we who are saved by grace through faith were crucified with Christ and identified with His death, so we who are saved by grace through faith are risen with Christ and identified with His resurrected life - for in Him we are born into newness of life. Because He died we are saved by grace through faith. 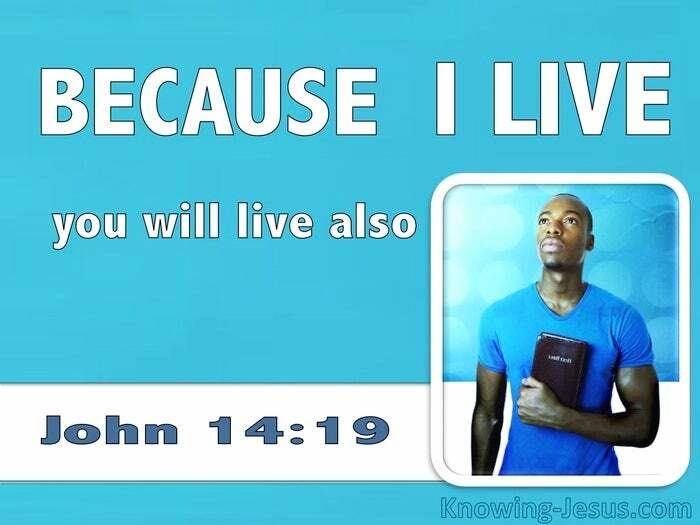 Because He lives we too will live and receive His resurrected life as a free gift of grace through faith. When Jesus rose from the dead He broke the power of sin and death in the life of all who would one day place their trust in Him - for just as He took OUR death sentence upon Himself on our account.. He also gave HIS “eternal, life privilege' to all who would believe on His name. There was so much that the disciples did not understand as Christ urgently started to tell them about the forthcoming Church age. And though there were to be further disclosures to be revelaed after Christ's resurrection and ascension.. it was not until the full counsel of God was revealed through Paul and recorded in the Word of God.. that they fully understood that; that because I live you will live also. Thank You heavenly Father, for Your amazing plan of salvation, which has rendered sin and death and hell powerless in the lives of all who trust in Christ for salvation. Thank You that He died for me and that by faith I have risen with Christ into newness of life. May I live my life to Your praise and glory in Jesus name O pray, AMEN.